Public Security Minister Gilad Erdan discusses murder of Ori Ansbacher, says security forces should determine it is nationalistic in nature. Public Security Minister Gilad Erdan spoke on Saturday night in an interview with Channel 13 News about the murder of 19-year-old Ori Ansbacher near Jerusalem. "When an illegal Palestinian alien commits a murder of a Jew in the State of Israel, this unequivocally must be determined as a nationalistic murder, no matter what he says or does not say in his interrogation. I hope that the competent authorities understand this, and if not, it should be legislated,” he said. 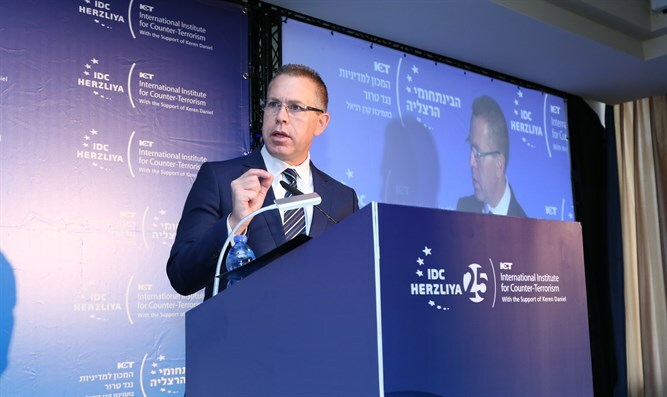 Minister Erdan also referred to those spreading rumors on social media about the circumstances of the young woman's death, including Yair Netanyahu, the son of Prime Minister Binyamin Netanyahu. “All these rumors on social media have caused me tremendous pain. Unjustified criticism of the Israel Police, a gag order is a routine procedure in the murder of Jews and Palestinians so that the murderer does not know [what the police know] and stays clear of the security forces," he said.